I have not as yet jumped on the Bitcoin bandwagon. Unlike other digital financial inventions that seemed obviously useful when they first appeared (e.g., Internet banking, P2P lending, two-factor authentication, etc. ), an open-source, math-based virtual currency created by an anonymous cryptographer seems a bit of a stretch. While remaining skeptical, I am at least coming to understand why it’s needed. And startups are beginning to show up with businesses built on top of the currency, which helps explain just how important it could be. Case in point: BTCJam, a global P2P lending outfit, with founders in Brazil and San Francisco, lends in Bitcoins. With participants in 85 countries, this is the first P2P lending platform that successfully crossed national borders. The startup has already done 2,700 loans worth more than $1 million since its launch a year ago. In comparison, Prosper originated about 6,000 loans worth $28 million during its first year. Prosper’s loan size in year 1 was more than 10x that of BTCjam (Prosper average = $4,800 in 2006). 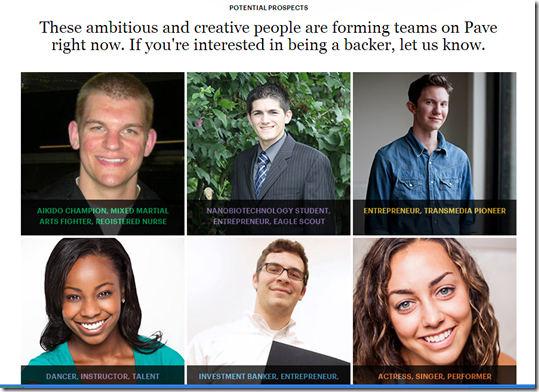 The company is currently in the process of raising about $1+ mil via Angel List. 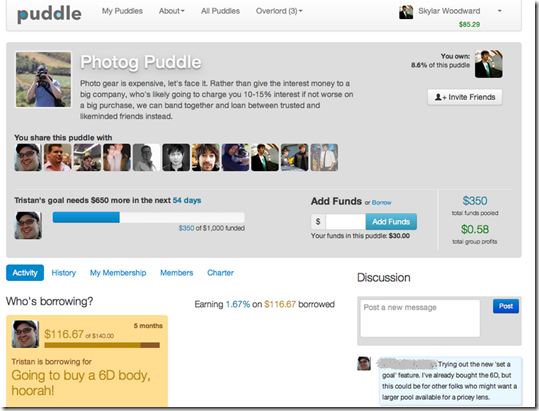 Like most P2P lending platforms, borrowing requests are vetted by the platform. Once approved, they are displaying to the network so that prospective lenders can fund the request. Generally, lenders spread their risks by only backing a portion of each loan. 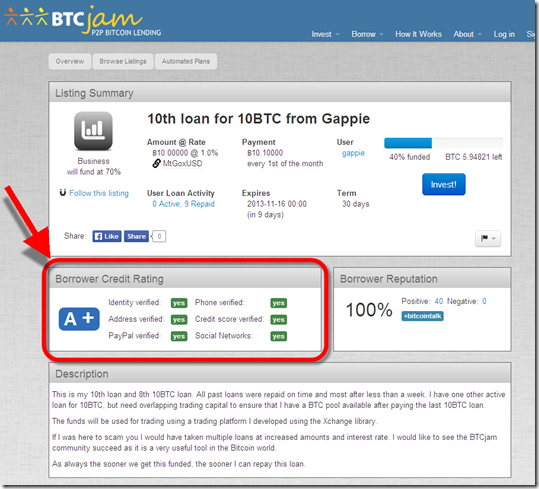 Since BTCjam is global, it cannot rely solely on traditional credit scores. Instead, it validates the borrower in a number of ways across various social and payment networks along with traditional credit checks, address verifications and income verification. The results are displayed within the loan listing (see screenshots below). Borrowers that have passed more verification steps and/or with more “social proof” (e.g., eBay seller ratings, PayPal verified status, Facebook friends, etc.) are more likely to be funded and at a lower interest rate. 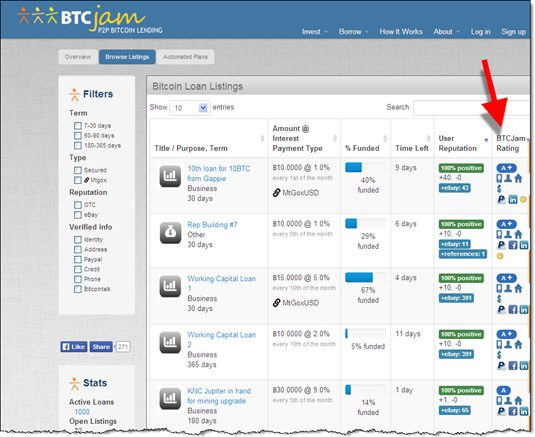 BTCJam has made 2,700 loans, of which 1,700 have been repaid, with 1,000 active. The company does not say how many have defaulted. Most of the borrowing is for small amounts over short time periods. The average loan amount is $400 to $600 with annual interest rate of about 45%. But most loans are very short duration with an average term of 35 days. The platform takes a 4% advance fee for loans less than 10 BTC (about $2,000) and 1% of higher amounts. Many borrowers appear to be testing the waters and/or building their reputations through short loans quickly repaid at nominal rates. In addition, there are a number of borrowers using the platform to make Bitcoin currency bets. Borrowers can choose to repay their debt in straight Bitcoins, but that entails a great deal of currency risk. To avoid that, borrowers can peg their loan to USD, GBP or other currencies. That way, fluctuating Bitcoin values are less of a concern if the funds are converted to local currency. Alternatively, borrowers can essentially short Bitcoins by keeping the funds in BTC and hoping the value against the USD drops. The company has had loan participants from 85 countries. 1. We have published three reports in P2P lending (OBR 127 in 2006; 148/149 in 2007; and SR-5 in 2009). Our latest P2P lending market forecast is contained in the current Online Banking Report here (Jan 2013, subscription). We also covered equity and debt crowdfunding a few months ago (see Online Banking Report on Crowdfunding, subscription). 2. We are just finishing a report on Virtual Currencies. We’ll announce it here by the end of the month. I am an unabashed fan of peer-to-peer (P2P) finance (see notes 1, 2). In theory, it makes so much sense to tap Internet efficiencies to match the buyers and sellers of money. On the other hand, there are good reasons to have highly regulated intermediaries, although that system is far from perfect as well. So, I’m looking forward to the hybrids we’ll be seeing in the next few decades. And I believe P2P lending is way more disruptive than what PayPal has done. PayPal introduced a vastly improved front-end to bank checking accounts and credit cards. The company created an extremely valuable franchise (note 4), but the banking system is still intimately involved in most transactions. PayPal stole revenues from acquirers and held a few deposits, but for the most part, had little impact on card issuers. However, Prosper, Zopa, Lending Club and the other P2P lending pioneers created virtual banks (taking in deposits and lending the money out) completely separate from existing financial institutions. And it’s about to get way more interesting as the concept takes off in the business financing/investing arena via what’s been called “crowdfunding” (note 5). 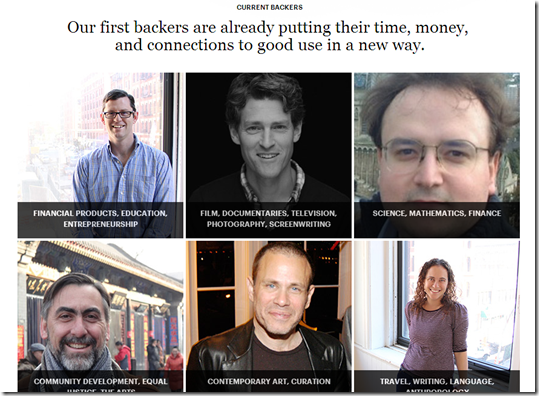 Bottom line: If you are a bank, learn to love crowdfunding and P2P. It’s disruptive, yes, but you can harness it to both help those who don’t qualify under your existing underwriting and increase your bottom line (note 6). Graphic: One of more than 50 books for sale at Amazon about Crowdfunding and Kickstarter. 1. Unfortunately, I’ve backed only one loan so far, earning a nice return on my $100 loan in 2006. 2. We have published three reports in this area (OBR 127 in 2006, 148/149 in 2007, and SR-5 in 2009). We are working on our fourth. 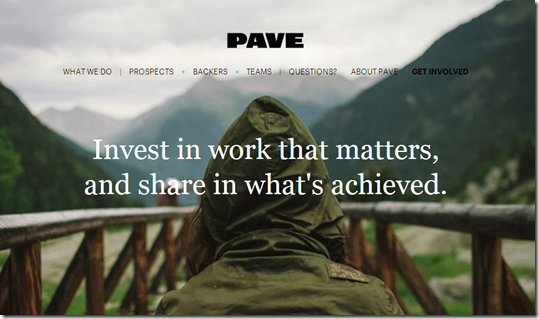 It will focus more on equity and debt crowdfunding for small and mid-sized businesses. 3. 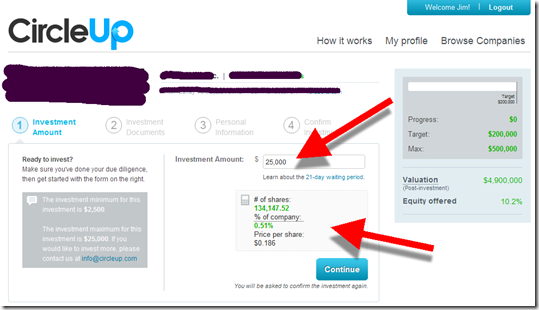 Zopa 2005 launch in the United Kingdom beat Prosper to market by almost a year. 4. eBay’s market cap is $60 billion, of which a significant chunk is attributed to PayPal. 5. There are hundreds of companies entering this space. 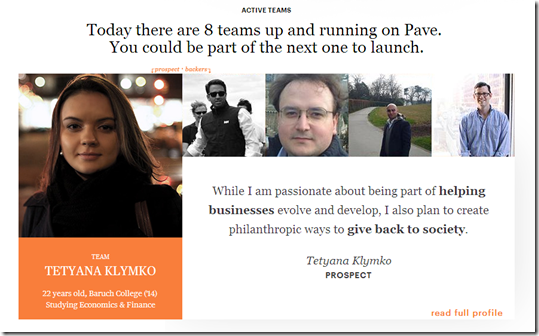 We are most familiar with two Finovate alums involved in debt-based crowdfunding (SoMoLend and Rebirth Financial). And we’ve written about equity-crowdfunder CircleUp, which was also featured in the NY Times along with SoMoLend this week. 6. 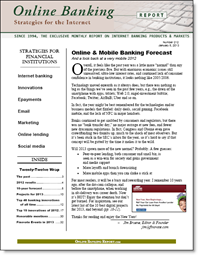 Our latest P2P lending market forecast is contained in the current Online Banking Report here (Jan 2013, subscription). Everyone says that business startups are a huge driver for economic growth. 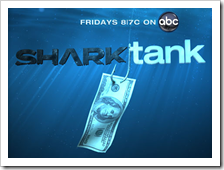 So, when was the last time you received a solicitation for an unsecured loan to start a business (note 1, 2)? It may not be unheard of, but it’s rare, especially since 2008. So today’s email from P2P loan pioneer, Prosper, really grabbed my attention (see screenshot below). Not only were they targeting a segment that’s generally overlooked, they were doing it an effective way. The direct subject line, striking graphic, and concise copy, are guaranteed to get the message out. My only concern is the reliance on the super low, 6.59% rate showcased (for AA borrowers, see highlighted section below). While it’s not a teaser rate, it’s also one that’s not readily achievable for most people needing $25k to start a business. 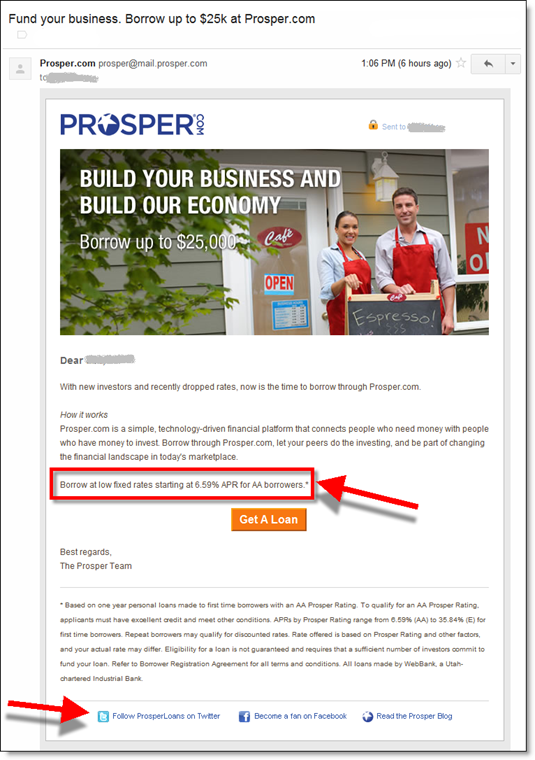 I’d rather see Prosper list the rate for a more typical borrower, or at least show a range of applicable rates. Still, I give it an A-, because most borrowers savvy enough to start their own business understand that "….starting at" means something higher at the end of the process. Note: Social media call to actions at bottom of message. 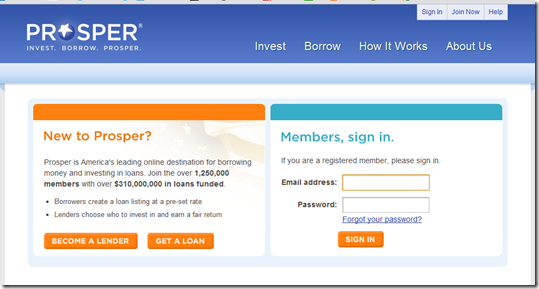 Note: Interested borrowers are dumped on a generic signup/login page. It seems like there should be some tie-in here to the email call to action. 1. Chase offered a great program in 2010 where business borrowers were given a lower rate for hiring new employees. However, it wasn’t targeted to startups. 2. I’m not on their mail list, but I know Silicon Valley Bank aggressively pursues startup businesses for financing deals. 3. We’ve covered P2P lending a number of times in our subscription service, Online Banking Report including updated U.S. forecasts in our Jan. 2012 report. This guest post was written by Peter Renton, (@SocialLoans), Editor & Publisher of peer-to-peer lending blog, Social Lending Network. 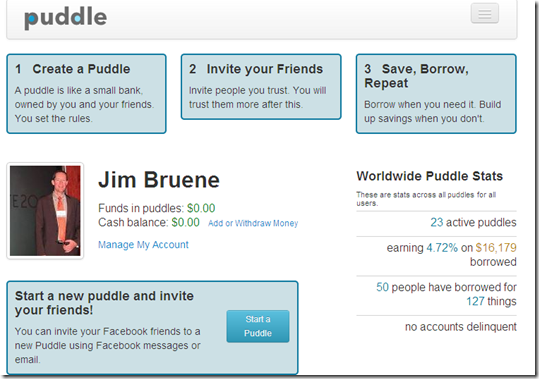 With the launch of Prosper in Feb. 2006, peer to peer (P2P) lending arrived in the United States with great fanfare. Borrowers no longer needed banks. Individual investors could be the banker and earn great returns. But, there have been challenges along the way. In 2008, the SEC decided P2P lending should be regulated as a securities business and both Prosper and Lending Club, which launched in mid-2007, were shuttered for half a year as they retooled. Both companies also initially struggled with higher-than-expected default rates. 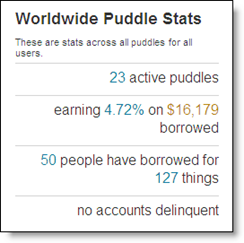 It is only now that P2P lending appears to be living up to that initial promise. 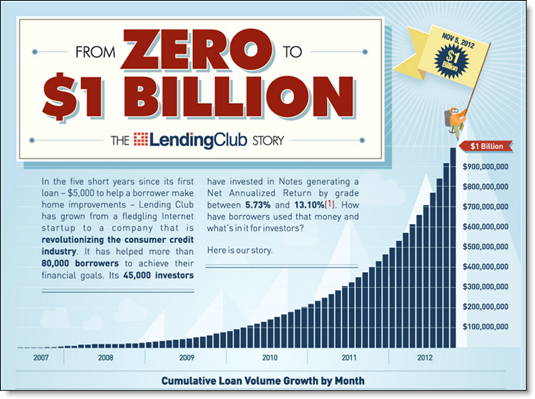 Last month was the best ever as lending volumes broke the record for the seventh month in a row. 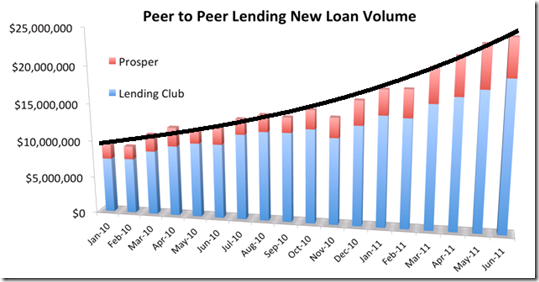 The combined volume of Prosper and Lending Club amounted to $25.6 million in June compared with $12.2 million a year ago, a 110% gain. As you can see in the chart below, the growth curve has been getting steeper. What is driving the growth? The most common type of loan by far, on both Lending Club and Prosper, is debt consolidation. People are trying to dig themselves out of credit card debt where rates can climb north of 30% if a payment is missed. In comparison, someone with good credit can get a 36-month P2P loan at 12% to pay off their credit cards in three years. Before the real estate bust, banks pushed home-equity loans aggressively. No more. It now takes great credit and substantial equity to qualify. 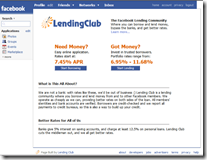 Last month Lending Club reported that 14% of its loans were used to fund home-improvement projects. Prosper said that number was 12%. It has been two-and-a-half years now since the Federal Reserve dropped its target-funds rate to zero. Fixed-income investors have been stuck with returns in the low single digits. Investors are looking for yield and some are considering alternative asset classes like P2P lending where returns are averaging around 10%, though it’s yet to be seen if that return holds as the loans season. Prosper CEO Chris Larsen attributes the high investor returns to the startup’s five years of experience. He said, “Since re-launching our platform in July 2009, we’ve delivered returns of 10.4% and default rates of 5.3% and lenders are responding favorably.” Their recent performance backs up these statements. Lending Club says that currently about one-third of investor money comes from institutional investors. In May, Prosper took on a new institutional lender who has invested close to $2 million in just two months and has pledged a whopping $150 million in the future. Prosper expects the balance of individual to institutional investor to resemble more of a 50/50 split as the category continues to grow. Clearly some of the big-money players are starting to allocate assets to P2P loans. For a couple years now, Lending Club has offered an IRA option they say has proven to be popular. 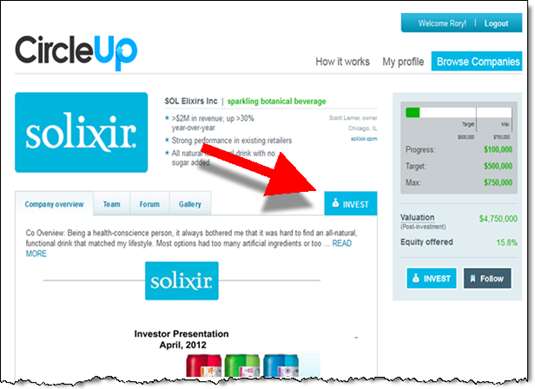 “Investors planning retirement are less concerned with near-term liquidity and are more interested in consistent returns and the ability of an investment to generate cash flow,” explained Scott Sanborn, CMO at Lending Club, “and we find existing investors who have been pleased with their returns who are opening larger IRA accounts to let their investment grow tax deferred.” Prosper does not officially offer an IRA although it is possible to set up a self-directed IRA with Prosper.